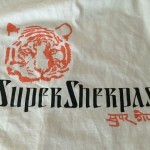 Going through my closet, I found shirt I bought in 2007 to support Super Sherpas, an Everest expedition made up of entirely of Sherpas. Sherpas are common guides for mountaineers who want to summit the highest mountain in the world. They live in the high, very high, altitudes of the Himalayas. Tenzing Norgay, a Sherpa, and named by Time magazine as one of the 100 most influential people of the 20th century, accompanied and guided Edmund Hillary to the first ever successful summit of Mount Everest. Sherpas continue to guide mountaineers to the top of Everest. Unfortunately, the Sherpa guides were/are not paid nearly as well as Western guides. I had the pleasure of meeting Apa Sherpa as he was preparing for the Super Sherpa expedition to Everest. The Super Sherpas expedition was an all-Sherpa expedition to support and raise awareness of the Sherpa people to further their opportunities in life, most of which did not have access to simple things we take for granted like schools. Apa had guided many mountaineers wishing to safely summit Mount Everest, and at the time, Apa held the world record for the most summits to Mount Everest. I believe Apa had 16 summits at that time (early 2007). As of 2015, Apa has summited Everest twenty-one times. Apa Sherpa is a very humble person, and I am blessed to have met him, but I didn’t take a photo, grrr. I didn’t have a smart phone back then…it was the Stone Age, what can I say? Apa moved to Utah, United States for a better education for his children. He is called the Tiger of the Himalayas–a title which is fitting due to his knowledge of Everest, his stamina, and his achievements, but it is somewhat ironic because Apa is one of the most humble people you will ever meet. Apa was in Nepal on April 25th when the 7.8 earthquake struck. He and the humanitarian group he was with to help further education opportunities in Nepal were okay, but they witnessed firsthand the devastation. Apa’s home village is very remote, and Apa made the trek there to help. The Apa Sherpa Foundation was created to help enable education and economic opportunity in Nepal. Please take a look at Apa’s Foundation. Nepal could use all the help it can get to help rebuild after the earthquake.